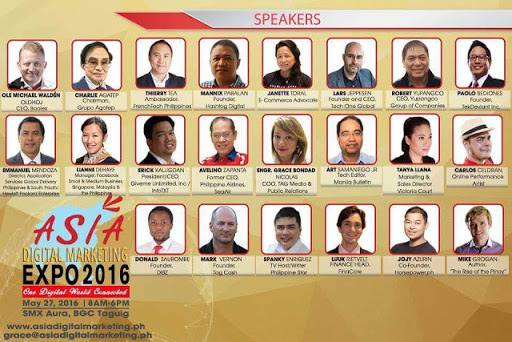 On May 27, 2016 at SMX Convention Center, Taguig, Philippines from 8AM to 6PM, Asia Digital Marketing Expo 2016 #AdMe2016 will happen and this time with Lianne Dehaye who manages the Southeast Asia Small & Medium Business team, focusing on Singapore, Malaysia and the Philippines. She has been with Facebook for three years and is currently leading the Account Management program within Asia-Pacific. She has been working in the online advertising industry for almost 10 years and has in-depth knowledge of search marketing, brand solutions and web analytics. Topic: “Facebook for Business: Beyond Likes, Comments & Shares”: Founded in 2004, Facebook’s mission is to give people the power to share and make the world more open and connected. People use Facebook to stay connected with friends and family, to discover what’s going on in the world, and to share and express what matters to them. Discover how Facebook’s marketing solutions can help Filipino businesses stay connected with their customers and drive real business results." Line up of speakers; -Lianne Dehaye, Manager, Facebook (Philippines, Malaysia and Singapore) -Emmanuel Mendoza, Director for Application Services Global Delivery Philippines & South Pacific, Hewlett Packard Enterprise -Grace Bondad Nicolas, COO, TAG Media & Public Relations -Janette Toral- Founder, Digital Filipino Club, Book Author and dubbed as the E- Commerce Guru of the Philippines -Robert Yupangco, President, Yupangco Group of Companies (Yamaha Music, Zoobic Safari, Manila Express, Misono Restaurant and more) -Thierry Tea- Managing Director (Philjets Group, GrabHeli Partner) -Ole Oldhoj, CEO (Boolex) -Lars Jeppessen- Managing Director (Tech One Global) -Mannix Pabalan- Founder (Hashtag Digital) -Jojy Azurin, Co Founder (Horsepower PH) -Spanky Enriquez- TV Host & Writer (Philippine Star) -Art Samaniego Jr- Tech Editor (Manila Bulletin) -Erick Kalugdan- President/CEO (Gimeme Unlimited Inc.) -Avelino Zapanta- Former CEO (Philippine Airlines and SeaAir) -Charlie Agatep- Chairman (Grupo Agatep) -Ana Kim- President, Onnet Global -Luuk Rietvelt- Finance Head, Finacore -Paolo Bediones- Founder, TekDeviant Inc -Mark Vernon- Founder, Tag Cash Reserve your slot now. Limited seats are available as of today. Registration fee is Php 4,000.00 with elegant lunch and snacks. Deposit your fee to TAG Media and Public Relations, BPI Account # 1680 0010 29. For inquiries and registration E: www.asiadigitalmarketing.ph M: 09166299381 Presented by TAG Media and Public Relations to promote the ASEAN region as a premier business destination. The conference serves as a hub for networking and spreading of ideas that help top management overseeing enterprises across the Asia Pacific region. Speakers are experts and leaders in their industries and engaged in momentous pursuits of significance to the ASEAN region. Attendees are senior leaders, high-ranking government officials and journalists covering the event.